Qwilr is built for the web, but we know your clients still need a printed version sometimes or a PDF for an archive. That's why we've built our PDF generation tools. You'll be able to save PDFs in a variety of file sizes, in A4 or Letter sized, and portrait or landscape. The PDF will be a printer friendly version of your proposal. The web doesn't always translate perfectly to print, so some things will change stylistically to focus more on a print version versus the web version. We always recommend sharing your web version whenever possible because that gives your clients the interactive version of your Qwilr Pages that everyone loves. You can access the PDF download from 2 places. The first is on your dashboard. Click the arrow to the right of your proposal and then choose the PDF icon. The second spot is from your edit screen. You'll see a download icon up at the top of the screen. From there you'll be taken to the PDF preview and download screen. 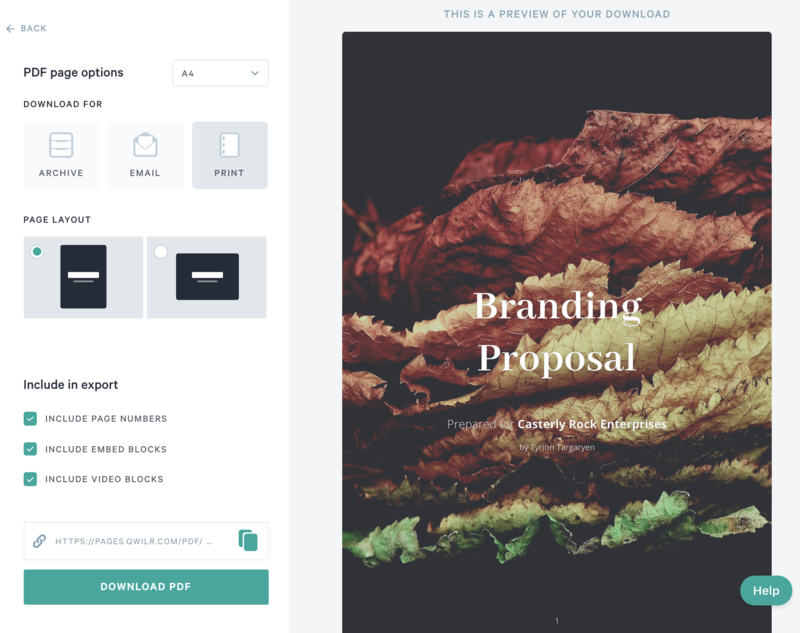 Preview how your PDFs will display. No need to download the PDF to view it first. Check out how it looks and make small tweaks to your Qwilr Page as needed to get the perfect PDF view. Choose your page size. You can choose between an A4 and US Letter sized files. Choose your page layout. You can choose a portrait PDF or a landscape one. Choose your page layout (compression amount). There are 3 different compression amounts: archive, email, and print. Choose the option that best matches your use case. Archive, for example, will be the smallest file size, but the greatest amount of compression. Email is a balance between the two and optimized well to be an email attachment. Print is the least amount of compression and optimized to look great when printed without degraded image quality. Chose whether you would like to include page numbers, embed and video blocks or remove them from PDF. Make your choices and then click on the download button. From within the same PDF preview page, above the download button, there is a URL listed. Make your layout choices and then copy your URL. From there you can send your clients a link or you could link text from within your Qwilr Page so your clients can access a PDF version as needed. Keep in mind, though, if you link to your PDF from within your Qwilr Page, the generated PDF will contain a link to the PDF. Very meta! Using our iFrame embed you'll be able to embed PDFs hosted online. Check out our article on Embedding PDFs to learn how to embed content from other PDFs right into your Qwilr Page.